The unprecedented season that has been 2016 continues to reveal the limits of the current co-management of fisheries between the Tribes and the state. The first quarter saw the breakdown of the Tribal and state season setting North of Falcon process. Pressured by a critically low forecast for returning coho salmon, the sides couldn’t reach agreement on seasons. But the fireworks really got going with the commencement of Tribal fishing outside of co-manager agreed upon seasons, a remarkable departure from decades of co-management success. And now, with the summer salmon season drawing to a close, we are entering a new phase–when the nature of the season will come into sharper focus. We begin to have access to catch-record information as well as other run-size related data sets. We believe these will show not only dramatic inequities in how the season was executed — but we suspect significant overfishing will have occurred by the Tribes. We’ll study more fisheries as the data becomes available, but for now let’s examine the Ballard Locks/Lake Washington run of coho–where publicly available data permits some analysis.. The count at the locks is shown at 18,779 fish, which is our starting point. That run is gill-netted by two groups, the Suquamish and the Muckleshoot Tribes–and data we’ve received has them conservatively netting 1000-1500 fish per day combined in the early season… Given that the season has been open for 20 days (opened on Sept 16), and presuming some decline in the fishery as the season wore on, we are estimating the combined harvest from these two tribes at something like 10,000 coho presently — which we believe is roughly equally split between the two Tribes. Presuming half of the catch was taken before being counted at the locks (Suquamish Tribe fishes downstream of the locks), the coho run arriving at Salmon Bay was 5000 fish higher than the count, or 23,779 fish. The list of agreed upon fisheries for the year (or LOAF, see Page 25 and 27 here) clearly states that 10,000 fish needed to arrive before a fishery can be opened, so we’re in agreement that it was reasonable to open fisheries in September. There were potentially 13,779 fish available to harvest this season. So did the Tribes overfish? In our view the answer is yes. They are entitled to 50% of the harvestable fish, which is just shy of 7,000 fish, and we believe they’ve already taken 10,000. If the numbers are correct (and we will review them in detail when they are published officially) that’s nearly 50% overharvest to date. More alarming? The Muckleshoot Tribe has just commenced 5 more days of additional gill-netting — From today, Sunday the 9th, and ending Thursday the 13th. They will be netting the length of the ship canal, Lake Union, and Lake Washington from the 520 bridge to within 250′ of the Sammamish Slough. On Thursday we reached out to the Muckleshoot Tribe, as well as WDFW, to raise this concern and ask for more supporting data to verify that the Tribes are within their allocation. Neither has offered any comment. 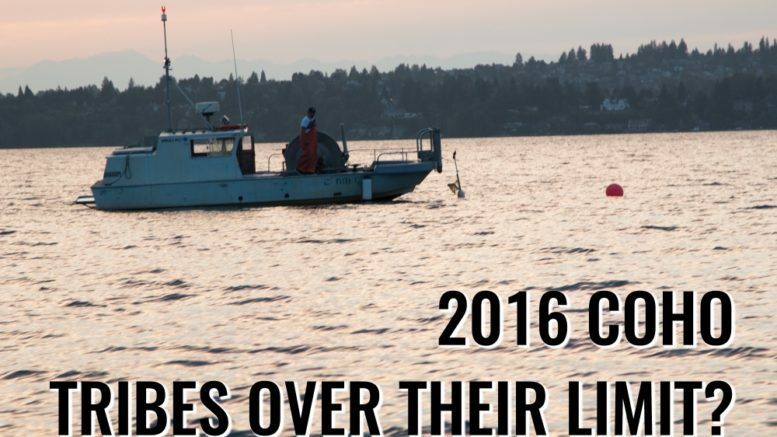 In our view, the department, and fish and game enforcement should stop these gillnet openings. If our estimates are right, the Tribes are well beyond their permitted harvest. In a pivotal season like this one — we believe the State must stand up to this situation and get the nets taken out. 25 Comments on "Tribes Overfishing? Questions Arise"
No one in any position of authority cares, except the tribes, and they only want to take as much as they can for themselves. Screw the rest of us, commercial and recreational. They don’t care. It is a total scam. The Tribes made a back room deal to have the “stakeholders” look the other way. It won’t stop until every fish is gone — then the tribes will ask for financial retribution. I fished in Tofino this summer it was off the chain. So my money goes there now. Are you saying that the only coho that count are the ones that are caught in the terminal area? Not the coho caught in the ocean? This is an incredibly back-of-the-napkin-at-a-bar sort of argument. Overharvest would mean that the tribes are fishing into escapement. But, what you’re arguing is that the tribes, fishing in terminal areas, are catching more than sports fisherman. And, that this is somehow wrong. What you’re ignoring is that a sport fishery doesn’t have the fire power to catch up to a tribal fishery in a terminal area. Sport fishing is open on Lake Washington last time I checked. The only solution here is for the tribes to shut down and allow way more coho to escape to the Issaquah Hatchery than are needed. Or, we could open a non-tribal commercial fishery on Lake Washington coho. The logical expansion of your argument is EXPANDING COMMERCIAL FISHING. Our assessment assumed essentially zero coho harvest in the ocean. While certainly there were some fractional impacts, the entire design of the seasons was to eliminate coho impacts and harvest. If you have data that there’s a substantial ocean harvest we should model, we’ll happily update this article with the details. However, the second point you make is mistaken. We are not comparing tribal catch vs. sport catch. We are comparing tribal catch to 50% of the harvestable fish. If they have harvested their share, then any additional netting they do is impeding non-tribal fishermen rights to access the state’s half of the harvest. These gill-net openers remove fish that non-tribals have a right to target. Netting downstream and within the open areas for non-tribal fishermen removes fish and blocks fish-holding waters–neither of which are acceptable. Additionally the justification for these openings has been “Harvestable Surplus” which we think is false. If they would like to make a foregone opportunity claim, then they can and should justify them as such. In that case their harvest should occur in such a way that they were entirely upstream of ALL non-tribal open fisheries–so as to ensure and protect non-tribal rights to access their half. Of additional benefit, by moving the net-openings closer to the hatchery, there will be less endangered chinook impacts. Finally, we think allowing the foregone opportunity claims to be approved would be a mistake. The state side could use the opportunity to consider how we might best allocate our unused harvest — rather than simply yielding it to the tribal commercial fishermen.. Enhancement projects and even food bank programs might benefit from these fish, and we’d be excited to see the state exploring proactive options here instead of yielding the opportunity to the tribal commercial fleet. So what you’re saying is that you are guessing your numbers are right and not based on any true or factual basis? There is factual basis for the early season numbers — and as we’ve clearly said we projected from those. We reached out to both the Tribe and the State last week for more precise data and comment and received neither. Was there any commercial taking of salmon, which is part of the sports angler 50%, in your estimates? I am not familiar with the Lake Washington fishery. I could take your arguments more seriously if I knew who *you* were. You say “our,” but as far as I can tell, you’re just one person, making stuff up as you go along. Where is your “About” page? A fair point, the About is necessary and will be posted within the week — all the biographies are being finalized and approved. But your charge that we’re making things up is false. We’ve accurately characterized the data we’ve seen and projections we’ve made from them. If you have more data, we’d be happy to amend this article. We reached out to both the department AND Muckleshoot Tribe 5 days ago for additional data comment and received neither. By the way Mr. Pattillo, we’d be thrilled to have you as a contributor here at Tidal Exchange. We’d love to provide you a platform to discuss fisheries, season setting, and any other topics you would care to comment on. We welcome knowledge and opinions (including dissent) here. Mr. Pattillo, you’ll now find About and other House Rules at the footer of every page. As we mentioned before, we’d be happy to have you as a regular or occasional contributor here. In 2016, there was little recreational impact(not harvest) in marine areas for coho, and no non-tribal commercial fishing for Coho within Puget sound. Another point of view to consider is that in 2015 non-treaty anglers had wide open coho fisheries in every Marine Area while many tribes did not fish when coho returned in dire numbers to drought stricken rivers. Considered. We are confident the Non-Treaty anglers did NOT exceed their 50% of the harvestable fish last year. If you have information to the contrary, we would be happy to reconsider. WDFW has no spine or control of the Tribes. We need a LAWYER out there that will take the people to court. If your out there take pictures of the boat numbers. Document everything! WDFW is a LIMP NOODLE! Serves them right to be exposed for what they really are. I am 50 and have been an active sportsman all my life, purchasing all the required licensure every year of my adult life. Not this year nor the following years until they GROW A PAIR! I worked at the Issaquah hatchery in the late 1950’s and we released about 1 million yearling coho every summer. We never in those two years had enough coho return to even come close to being able to take enough eggs to supply our needs. We transported eyed coho eggs from the Skykomish hatchery above Startup to supply our need. Can Issaquah now have enough coho return to supply their egg needs without bringing eyed eggs in from another hatchery? This is complete BS, I have lived and fished all my life in wash. And have seen whole dumptruck loads of salmon dumped on dead end roads in forks, the indians get the roe and dump the rest! Just waisting the fish, those could be giving to food banks, made dog food, many ways they could put salmon to good use! But they dont care, its all about the money! What happened to saving mother earth? These tribes should have to follow same rules as the rest of us! If we leave it to them we will have no salmon left! I’m amazed ( but not surprised) at the spokesmen for WDFW ( Mr. Patillio) comments coming back in such a condescending tone. After all, who are we, the tax paying, license buying sportsmen to question how “our” resources are managed! Perhaps Mr. Patillio would like to comment on “why transparency is NOT IN THE BEST INTEREST OF THE CITIZENS OF THIS STATE”! Well???? Why can’t the NOAA Federal Office of Law Enforcement do anything about this since WDFW can’t? It seems plain and simple that there is documented evidence that shows tribal fishermen are harvesting over 50% of a run, while non-tribal fishermen were not given a reasonable opportunity to harvest their 50%. That would be in direct violation of the Boldt Decision. I am not sure if reports from catch record cards are recorded anywhere, but I am sure it would show historical evidence that sport fishermen harvest very few salmon in Lake Washington. I am pretty sure less than 1% of the non-tribal sport fishing quota was harvested this year. That being said, I am not totally opposed to allowing the tribes to harvest the foregone opportunity excess in the lake. However, I feel it should be utilized as a bargaining chip for future agreements on co-management. If no agreement can be made, then I support rejecting all applications for continued fishing past tribal quotas. Let the salmon pile up at the hatchery and give them to food banks, or even let their carcasses flood the ecosystem with nutrients. Back to my original point though, has any sport fishing advocacy group made contact with the NOAA Office of Law Enforcement to see if they are willing to get involved? Do you check the source of comments associated with your articles? Regarding comments: We like most news organizations, moderate comments that are off-topic, in poor taste, or contain abusive language/slurs. While we do not fact check user comments, we are very interested in fact-checking our own content. That is why, four days before we published this story, we emailed specific comments/questions to you personally, as well as Director Unsworth and Ryan Lothrop. In that mail we included the core analysis we had done, and requested confirmation of our assertions. We additionally sent questions that same day to Mike Mahovlich with the Muckleshoot Tribe. Silence and contempt breed frustration and anger. WDFW, stop appeasing the Tribes and face reality. YOU’RE BEING PLAYED!! !